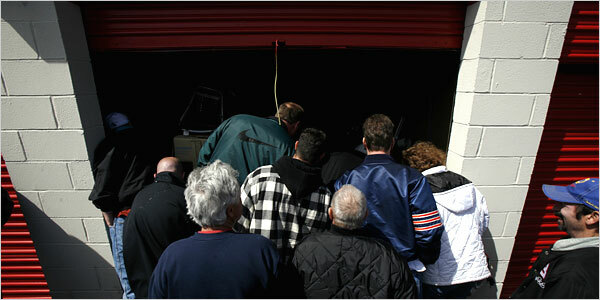 As storage auctions gain in popularity, they begin to draw a wider audience than its usual clientele. Auctions are more crowded than ever, and it's becoming much more common for families to attend auctions together. In some cases, parents even allow their children to bid on units as a lesson in money management and responsibility. While bringing your kids to a storage auction isn't illegal, some auctioneers, storage facilities and other bidders may frown upon it. Before choosing to bring your children to an auction, it's a good idea to understand the pros and cons. Many storage facilities do not allow children on their premises due to liability concerns. Their insurance policies might not cover accidents, so they'd want to reduce the likelihood of accidents by forbidding children or requiring them to be closely watched. Many fellow bidders may disapprove of children at auctions because they can disrupt the proceedings. Younger children might slow you down and make if difficult to get your unit cleaned and all of the items loaded and removed from the unit. Auction hunting is often long, exhausting work. You'll be on your feet for several hours and may need to endure hot weather or other inconveniences that your children may not be prepared for. It's best to check with the auctioneer in advance whenever possible to see if there will be any issues with bringing your kids to the auction. If in doubt, it might be a good idea to find someone to watch your children while you're bidding, at least the first few times you scope out a fresh auction. As you get more comfortable with the storage facility, auctioneers and fellow bidders, you might feel more comfortable bringing your entire family. So, how do you feel about children being at storage auctions? Leave your interesting and creative responses in the comments section below. For years, the storage auction business operated in much the same way: A storage unit would go into default, the property manager would send out legal notices, then it would set up a live auction to sell off the unit’s contents. Traditionally, these auctions were always advertised through local newspapers, with the sales generally being attended by the same group of people week after week. Storage unit auctions were a small, little-known business that made some decent money for the handful of regulars who knew what they were doing. All of that started to change once the storage auction reality shows opened up a window to this world for anyone who wanted to peek into it. Suddenly, fueled by dreams of found treasures and a desire to beat the recession, scores of new auction hunters flooded local auctions, hoping to replicate the successes they’d seen on TV. In response to this new demand, the storage auction business took off, and technology helped speed along the process. The Internet has been crucial in the evolution of the storage auction business. Storage facilities began using their websites to advertise upcoming auctions, moving away from print media. Auction listing services started aggregating this information, making it easier than ever to find upcoming sales. The most dramatic change, however, has been the development of online storage auctions. These virtual auctions take place over the Internet, following the familiar format of eBay or similar auction sites. Facilities can post photos and descriptions of their for-sale units, allowing interested bidders to view them and bid from the comfort of home. This dramatically widens the audience for any particular sale and is much more convenient for buyers and sellers alike. It also opened up the doors for private sellers to put their own units up for auction, allowing them to pay off their storage bill or simply make some extra money from unwanted items in storage. Online auctions are great for buyers because they’re convenient. Instead of driving around town to see units that may not even be worth bidding on, you can browse auctions at your convenience throughout your day. You’ll only need to leave the house once you’ve won a unit. These sales are great for sellers, too, since they generally bring in greater profits and are much less of a hassle to put together. Once the online storage auction revolution was underway, plenty of people have tried to get on the bandwagon by offering web space for these auctions to occur. In most cases, the sites would make their profit by charging fees to buyers or sellers. Others would work on a subscription basis, charging a flat fee per month for the benefit of having access to all of the ongoing sales. You don’t have to pay a premium to get in on the virtual storage action, however. OnlineStorageAuctions.com is an entirely free service that offers all of the benefits of other sites without the price tag. The site allows you to buy and sell with no additional fees, and it sports a massive community and plenty of auction variety from across the country. If you’ve never tried your luck with a storage auction before, now is your chance. With mobile bidding available straight from your smart phone, you can literally start buying from anywhere, no matter how busy your schedule may be. So, what do you think about online storage auctions? Which storage auction format do you prefer, online or live? The Online Storage Auctions Forum is the web's largest storage auction community, and it has over 4,000 active users and nearly 35 thousand posts. Many of these users come and go, but a core population remains to discuss the nitty gritty reality of the storage auction and resale lifestyle. If you're involved in storage unit auctions and want to learn more as a beginner or share your experience as a pro, StorageAuctionForums.com is an invaluable resource for news, information and socialization. The "Noobie Center" is one of the most active places on the forum and for good reason. Many newcomers join just to ask questions here before going on their way; others stick around to provide their own insight to fellow newbies as they gain more experience. Being a long-term member, you're bound to make friends and start to establish StorageAuctionForums.com as your "home" on the Internet. Because the forums cover so many topics, you're sure to find something to interest or surprise you, even if you consider yourself a well-seasoned professional. The forum covers multiple topics of interest to auction-goers, including places to share auction experiences, discuss weird and wacky finds, and show off your best discoveries. You can also take advantage of our knowledgeable network of members to get information about auction questions that you may be unfamiliar with, like how vehicles are handled at an auction or what to expect at your first shipping container sale. There's even sections dedicated to reality TV and storage auction news so you can stay on top of the newest developments. One of the most valuable resources offered by the forum is the opportunity to network with other buyers and sellers. Local forums for regions across the U.S. and around the world provide a way to meet others in your area, and sections of the forum are devoted to every kind of sales method imaginable from Craigslist to flea markets. You might even find a buyer among the fellow forum-goers looking to add to his collection! By now, you’ve probably guessed that the reality shows like Storage Wars and Auction Hunters are exaggerated and fictionalized. The odds of coming across an incredibly rare artifact, signed one-of-a-kind memorabilia or historically significant document in a storage unit are pretty low, although such things do occasionally happen and tend to make headlines when they do. Just because you’re not likely to become a millionaire from the contents of a single storage unit, though, doesn’t mean it’s not worth attending an auction. Smaller items can and do add up, and storage units can be filled with a number of valuables if you know what to look for. The type of items stored in a facility will depend in part on the neighborhood the unit is in. People store things for many reasons, and their reasons might affect what they’re keeping inside. For example, if the storage unit is in a common vacation town, it might belong to someone who summers there rather than living there full-time. If so, it might be filled with more sporting, fishing, hunting or other specialty equipment than housewares. Storage units in Hollywood do have a higher chance of holding celebrity memorabilia, although don’t get your hopes up too much. -- They’re moving and need a place to keep things while they’re settling in. -- They moved from a bigger house to a smaller one and need extra space. -- They’re undergoing a divorce or other life change and need to keep their items tucked out of the way. -- They simply have too much stuff to keep in their home. -- The tenant passed away. -- The tenant went to prison, was deployed or otherwise had to leave his belongings in the care of relatives, who forgot about them. -- The tenant fell on hard times financially and couldn’t afford to make rent. Most of the time, there are a few items you can count on being in some or all of your units: furniture, small appliances, electronics, household items and clothes. Antiques, artwork, office equipment and tools are also not uncommon. All of these can be resold if you’re patient. Some of the more valuable items can be sold individually on Craigslist or eBay; smaller items are better sold in bulk at a yard sale. Other common items, like tax records and family photos, pop up in most storage units. These can often be left with the facility manager to be returned to the tenant if he ever comes back looking for them. The tenant’s circumstances will affect what type of things you’ll find in a unit. A unit rented by an elderly man with a lot of extra belongings and no heirs will look very different from one rented by college student who couldn’t afford her rent. This element of suspense is what makes this sort of modern treasure-hunting so exciting. So approach your first few auctions with an open mind and you might be surprised by the types of treasures you might find. -- Storage unit auctions happen when a tenant fails to pay the rent for his unit. After the facility attempts to contact the delinquent tenant, the unit is put up for sale. The sale must be advertised publicly and auctioned to the highest bidder. -- Most storage facilities save their delinquent units to sell them all at once to reduce hassles and maximize bids. -- Storage facilities aren’t out to profit from auctions. Most are lucky to break even. They mostly just want to empty out the unit so that they can start renting it out to someone else. -- When you arrive at the auction, you’ll have the chance to look inside the unit, but you can’t enter it. Bring a flashlight so you can see what you’re looking at. -- Bidding will start after everyone’s had a chance to see the unit, and it’ll continue until no higher bids are placed. This can take a while if there’s a lot of people there or if the unit is particularly attractive. -- If you have the high bid, you’ll need to pay the auctioneer after the bidding. Be sure to bring cash as checks and credit cards are not accepted. -- After you win the unit, you’ll have about 48 hours to empty it out, so be sure you have somewhere to store your items. Once you get down the basics of storage unit auctions, perfecting the art of bidding takes a bit of time and practice but it’s not difficult. Your biggest goal is to research the type of items you’re likely to find and figure out what will sell for the most on the resale market. Once you know what an item is worth, you’ll be able to keep your bidding in line to maximize your profits. If you've been in the storage auction and resale business for long, you've probably heard about online storage auctions, at least in passing. These auctions are the newest trend in resale, and they're growing in popularity as people learn about their convenience and take full advantage of them. If you've never taken part in an online auction, though, you may be reluctant to try it out. Fortunately, it's easy to participate in an auction -- and it costs nothing aside from the cost of the winning bid itself. Online self storage auctions take place when a unit is photographed and placed on a site where bidders can view the unit and make bids. The bidding process is similar to eBay and other online auction sites. At the end of the auction, the bidder exchanges money with the person auctioning off the unit, and goods change hands. Until recently, online auctions were prohibited in many states due to lien laws. Now those laws are being revised to allow facilities to put units for sale. Additionally, there are ways to sidestep the lien laws, such as running an online auction in tandem with a live auction. Finally, private sellers can take advantage of online auctions as well, so not every auction you see will be a lien sale. In terms of cost, this varies depending on what auction service you use. Some of the auction sites do charge fees to both buyers and sellers. They may collect a bidder's personal information and charge for each bid or transaction. Others may take a percentage off the top of the winning bid and pocket that money. Not every site works that way, however, and you can save money by using a site with no overhead cost. The fastest-growing of these is OnlineStorageAuctons.com, a site dedicated to developing online storage auctions without taking money from the pockets of buyers or sellers. OnlineStorageAuctions.com acts as a mediator between buyers and sellers. It offers a platform for users to engage in auctions and purchase items, and it also enables users to leave feedback and participate in the world's largest storage auction community. It does not, however, collect any credit card information or otherwise charge its users. The first step to starting a resale business is finding merchandise to sell, and San Antonio storage unit auctions are a good place to begin your search. You never know what you might find within an abandoned storage unit, and you may be able to identify very profitable items. Before you can succeed with storage auctions, though, you’ll need to know where to find them. 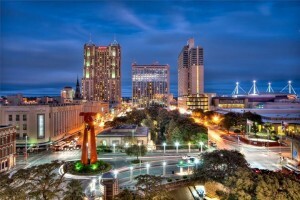 San Antonio is a big city, and storage auctions in San Antonio occur year-round at all of the local storage facilities. One of the easiest ways to figure out when the next auction will be is to call the storage facilities themselves or check their websites. This will often yield an auction schedule that you can refer to when making your plans. However, not every facility has the time or patience to field these questions, so you might want to do some more independent research before giving it a try. One good source for San Antonio storage unit auctions news is the local newspaper. By law, storage facilities have to advertise their auctions, so the paper will have plenty of notices. For best results, try to check a mixture of major city papers and smaller suburb papers. Some of the best auctions are those that haven’t been advertised very thoroughly. Another option is to use an auction listing service for the state of Texas or the country. Be aware that country-wide services usually aren’t as thorough as state-based ones. You’ll probably need to sign up for an account and pay a subscription fee, but getting an accurate schedule without spending hours on independent research makes it well worth the cost. 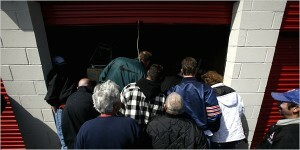 For the complete storage auction schedule for the San Antonio area, we recommend AuctionsTX.com. 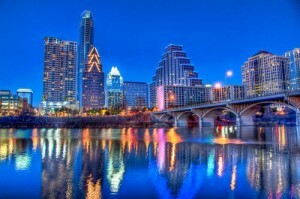 As the capitol of Texas and self-proclaimed center of “weird” in the state, Austin is diverse and unique. This makes it a great place to live but also an excellent destination for treasure hunters of all kinds looking to score interesting finds at storage auctions. 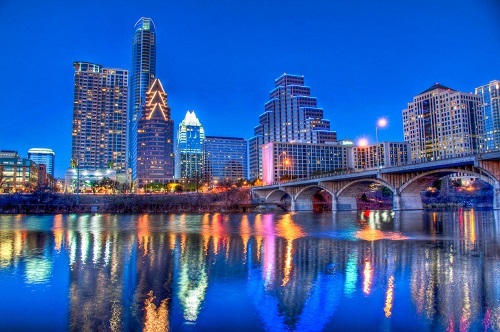 Whether you’re a long-time Austin resident or just plan on visiting for a few auctions, the storage sales in the city shouldn’t be missed. Of course, before you can plan to attend storage auctions in Austin, you’ll need to know where they’ll be held and at what time. Building a schedule of upcoming auctions is the first step to starting any auction-hunting or resale business. If you know where to look, you can find an auction happening every week in Austin, and knowing which of these will be worth your time will save you money and hassles. When you start your search, you might want to try the facilities closest to you. Their convenience may mean that you’ll visit them often and develop a relationship with the facility owners, so it makes sense to attend auctions close to home. Keep a list of what facilities you see nearby and check to see if they have a website listing auction schedules. If not, consider calling the manager to get an idea of when auctions occur. For auctions further from home, you have a few options. If you know of any auctioneers in the area, you can use their websites to find upcoming Austin storage auctions. You can also check local newspapers, both big and small, to find ads for sales. By law, storage facilities must post these ads in advance of the sale, so you should be able to get some details for a variety of units that way. If you’d rather avoid the hassle of digging up all of this information on your own, there’s an easier way to find storage auctions in Austin. Use the services of an auction listing site like AuctionsTX.com to gather information about upcoming auctions and plan your route. While many sites exist, most are national and offer limited results, so be choosy about what service you use. AuctionsTX is the largest and most comprehensive listing for Texas, and it provides its results in an easy-to-follow format that makes planning simple. If you’re looking to get serious about storage auctions, it’s a service that’s well worth investing in.